The Works | Kids in T.O. It all started with a peanut butter chocolate milkshake. Pre-kids pre-marriage my husband and I used to dine at the original Works in Ottawa. It was something special. Now, more than a dozen years later, you see these super burger joints across Ontario. So when our kids request “burgers-fries-and-ketchup,” we head to one of Toronto’s two locations. By far the kids’ favourite? No surprise. 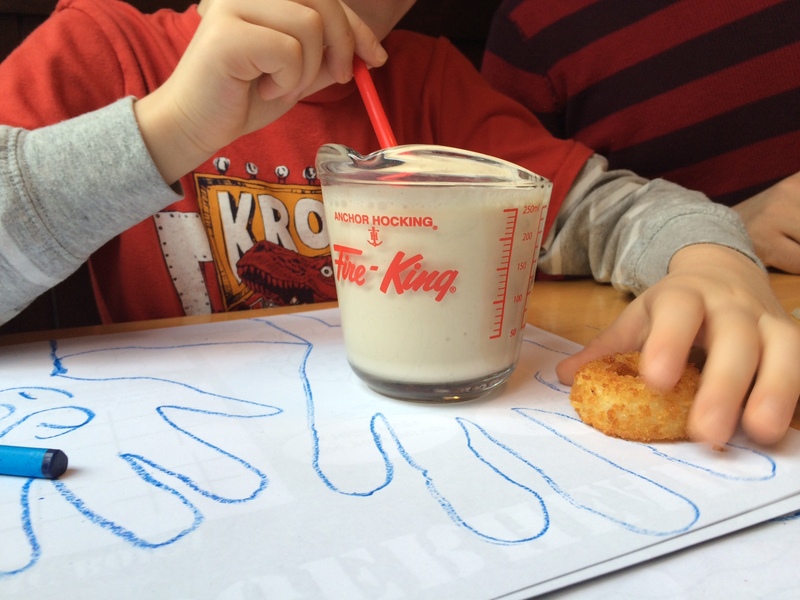 A jr-sized peanut butter chocolate milkshake to share. Getting there: Driving, paid street parking is $3.00/hr in the area. There is a flat-rate private lot next door. Nearest TTC is King Station on Yonge line – 0.5 km away. Menu: Adults have a choice of 50 different gourmet topping options and seven different patties. The kid menu has three burgers (beef, veggie or chicken) with a few options from plain or cheese to real KD or peanut butter and bacon. (Note: The kitchen uses peanut butter in the kitchen.) Gluten-Free buns, burgers, poutine and toppings. Other allergen info chart. Patio time: Roof top patio at Wellington St. location. In the hood: St. Lawrence Market (South Market Tuesday-Saturday/North Market Saturday and Sunday) and Rainbow Cinemas (with Movies for Mommies) are one block east. Hockey Hall of Fame is 500 m southwest at Yonge and Front.